The original part of the property is believed to have been built in about 1971 with subsequent extensions into the first floor in the 1980s and the gîte in the 1990s. It stands in attractive gardens and paddocks extending to about 3 1/2 acres. . It has been completely renovated and benefits from versatile accommodation which could easily be used for a B&B and a gîte. The gîte can be let with one or two bedrooms for up to 425€ per week. It has double glazed windows throughout, a new fusebox, and has had a new kitchen and bathrooms. It is close to a bridleway and the Andaines Forest making it ideal for riding, walking and cycling. Viewing is highly recommended. 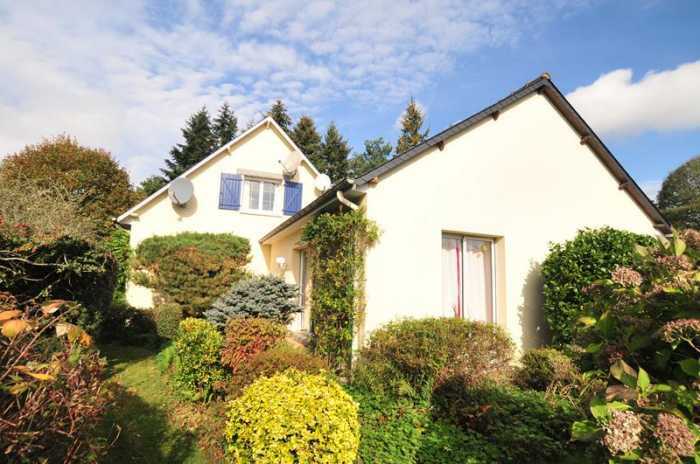 The property is situated in the Orne department of Basse Normandie in the north west of France. The area is within the Normandy National Parks region and the nearest village is within an easy stroll and has a shop/café. A short distance away is the village of Champsecret with a hairdresser, bar, bakery and small shop and Juvigny sous Andaine, the neighbouring village which has a school, two restaurants, a butcher, a baker and various other amenities. The nearest major town with all amenities, including a mainline train station with direct access to Paris is at Flers which is 15 km away. Closer to home is the Medieval town of Domfront (about 5 minutes' drive) which caters to all every day needs, including doctor's surgery, pharmacies, schools, shops, bars and restaurants. The renowned Spa town of Bagnoles de l'Orne is about a 20 minute drive from the property with lake, restaurants, and 9-hole Golf Course. The property is 89 km away from the ferry port at Caen Ouistreham, the closest port and just over 4 hours' drive from Calais. Entrance Hall Stairs to first floor with cupboards under. Tiled floor. Built-in shelving. Electrics. Kitchen 3.49 x 3.46m Window to rear elevation. Tiled floor. Radiator. Range of matching base and wall units including built-in oven and 4 ring gas hob with extractor over. Wine rack. Space and plumbing for slimline dishwasher. Stainless steel sink and drainer with mixer tap. Worktops and tiled splash-backs. Space for free standing fridge/freezer. Telephone socket. “L” shaped Lounge/Dining Room 7.32 x 3.67m and 3.87 x 2.38m Working fireplace. Tiled floor. 2 radiators. 2 pairs of glazed double doors to south and glazed double doors and side panel to west elevations. Coving. Inner Hall Tiled floor. Radiator. Bedroom 1 3.53 x 2.68m Glazed double doors to south elevation. Laminate flooring. 2 built-in cupboards and shelving. Radiator. Cloakroom Tiled floor. WC. Shelving. Bathroom 2 obscured glazed windows. Bath with mixer tap/shower fitment and screen. Tiled floor and fully tiled walls. Vanity unit. Radiator. Bedroom 2 3.46 x 2.71m Laminate flooring. Glazed double doors to south elevation. Built-in wardrobe and vanity unit. Radiator. Bedroom 3 3.44 x 3.33m (can be used with main house or Gite as connecting door to Gite). Laminate flooring. Radiator. Window to rear elevation. Built-in wardrobe. Landing Tiled floor. Walk-in wardrobe and storage cupboard. Hatch to loft with drop down ladder. Bedroom 4/Games Room 8.64 x 5.19m Tiled floor. Window to west and Velux window to south elevations. 2 radiators. Sloping ceiling. Shower Room Velux window. WC. Fully tiled. Vanity unit. Shower. Heated towel rail. Extractor. Bedroom 5 4.77 x 3.56m Window to east elevation. Radiator. Eaves storage cupboard. Entrance Hall Tiled floor. Radiator. Cupboard housing washing machine and tumble dryer. Hatch to loft with drop down ladder. Cupboard with trap door to a ladder leading down to a hidden wine cellar. Cloakroom WC. Hand basin. Extractor. Door to Wine Cellar and electrics. Shower Room Window to north elevation. Tiled floor. Vanity unit. Extractor. Shower. Convector heater. Lounge/Dining Room/Kitchen 6.55 x 3.49m Sliding patio doors to south and east and terrace. Tiled floor. 2 convector heaters. Kitchen area with matching base and wall units. 2 ring electric hob with extractor over. Space for under counter fridge. Sinks with mixer tap. Tiled worktops and splash-backs. Ventilation. Bedroom 1 5.57 x 3.52m (max) Sliding patio doors to east elevation. Built-in wardrobe. Telephone socket. Convector heater. Double wooden gates lead to gravel drive. The garden is laid to lawn with mature shrubs. Outside lighting. Small pine wood. Paddock – fenced all round. Variety of trees include apple, pear, peach, cherries, fig and walnut. Vegetable section. To the rear of the property is a tarmac drive and brick paviour drive to Garage. Covered tiled seating area. Boiler Room 4.87 x 3.77m 1,500 litre oil storage tank and boiler. Velux window. Shed 8.68 x 5.24m. Attached Garage 8 x 2.83m. Potting shed. Mains drainage, water, electricity and telephone are connected. Broadband internet connection available. Oil fired central heating.